Driver’s heartfelt, often funny, story will be sympathetic to today’s college graduates as they also struggle to find meaningful work. 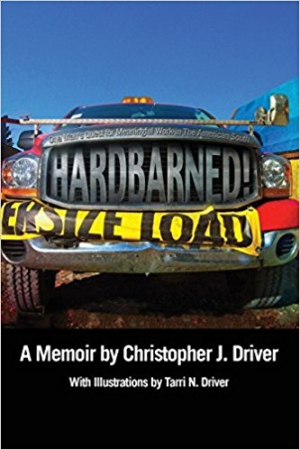 Christopher J. Driver’s memoir Hardbarned! is poignant and self-deprecating, about the college graduate’s idealistic search for the perfect, fulfilling job, and the trials and tribulations he encountered in his quest. When Driver completed graduate school, his goal shifted to finding an occupation that would satisfy the “trifecta” of “interests, values, and skillset” he’d nurtured—marrying his love of writing and music, providing sustenance, and satisfying his desire for meaning. Instead, he found not a fairy-tale happy ending, but a commitment to a hardscrabble life as a blue-collar worker. After stints as a dishwasher and server, video rental clerk, computer salesman, shoe salesman, magazine distributor, and administrative assistant, Driver settled into a job as a barn hauler, a job he calls “a monstrous, soul-crushing force at the center of my existence.” It put a roof over his head, though, while he continued to seek professional perfection in the American South. Driver demonstrates a natural gift for gab. His innate talents at observation and introspection are important elements of the narrative. It alternates between his working past and present, providing details about the elements involved in each job. Chapters are supplemented with his keen observations about the modes of work. Despite his often difficult circumstances, Driver remains a positive and hilariously upbeat narrator. Driver’s wife provides well-placed illustrations that emphasize elements of the narrative and break up his long digressions into job specifics. Even when digressing, though, Driver’s tone remains conversational and warm; his ear for dialogue provides much of the humor in the narrative arc. Other players’ words and actions illustrate and inform his observations. A discussion on the applicability of liberal arts degrees and the lack of job opportunities for graduates proves heartfelt. Driver addresses the problem throughout the book, providing relevant research and examples to back up his assertions. The term “hardbarned” comes to describe not only the troubles associated with his barn-hauling work but also Driver’s state of mind, and will be found sympathetic by today’s college graduates as they face related difficulties. Along with discussions of his career and education, Driver also interestingly draws from his musical studies to philosophize about punk, which he finds to be rooted not in violence but in creative thought that challenges the mainstream in a respectful way. This plays out across accounts of his struggles; respect and dignity always stay front and center. Hardbarned! is a thoughtful and highly entertaining memoir. It pokes fun at the liberal arts and attitudes in the American South alongside its poignant observations about the harsher realities of finding soul-sustaining work.